Charlize Theron shines in a funny, honest and occasionally excruciating love letter to motherhood. Director Jason Reitman has wobbled creatively (that’s putting it charitably) since 2009’s Up in the Air, screenwriter Diablo Cody started off strong—maybe too strong—with Juno, and Charlize Theron added both Mad Max: Fury Road and the shockingly inept Gringo to her recent filmography. But when you put all three of them together, something magical happens. It did, darkly, with Young Adult, a casually brilliant comedy starring Theron as a vicious failed-to-launch ghostwriter; and it’s occurring again with Tully, a major movie about motherhood in which Cody’s signature sarcasm has deepened into anxiety, exhaustion and wisdom—she’s truly becoming a voice for the ages. 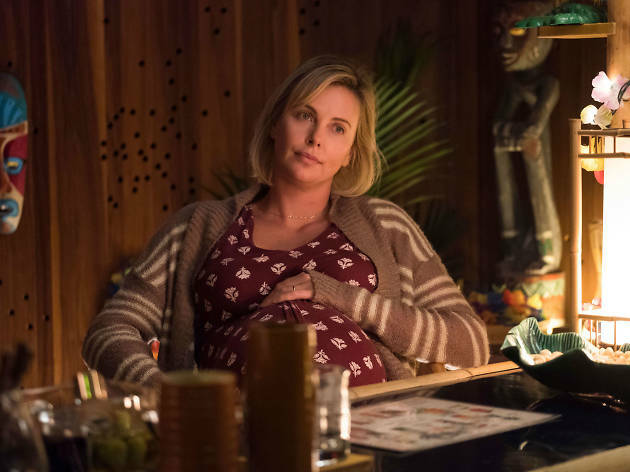 Marlo (Theron, at her rawest and funniest) is a heavily pregnant suburbanite who seems completely tapped out by her two preteen children, one of whom may be autistic. She’s fallen into slovenly disrepair and the kind of bone-deep resignation that, in a killer bit of physical humor, has her marinating in an exploded bottle of soda and taking her shirt off at the dinner table rather than cleaning it up. The baby’s arrival doesn’t help things, but then her wealthy brother gifts her the services of a “night nanny” who shows up in the sparkling, wide-eyed form of 26-year-old Tully (Mackenzie Davis, who should be a huge star by now), eerily intuitive to Marlo’s every need. “You’re the baby,” Tully tells her, ushering her off to her first real night’s sleep in weeks. Keeping his cutesy editing to a minimum and leaning into the performances, Reitman develops their relationship past employer and heaven-sent angel into a fascinating Gen X–millennial friendship that’s geeky and verbal, one that draws out similarities and differences (mainly across the wide chasm of becoming a parent, thrice over in Marlo’s case). By doing so, Tully approaches a provocative idea about the implicit death that comes with every birth: that of a woman’s younger, free-spirited self. Cody has a twist up her sleeve that isn’t quite necessary, nor does she need flashes of a highly symbolic mermaid to make us understand the primal nature of her tale’s appeal. But overall, everyone rises to the occasion of a special project of subtle significance: a comedy about nothing less than the proper way to say goodbye to the past.